Hi, I am your go-to guy if you want to get things done in Vietnam. I prepare you to work with factories and introduce you to them. May I introduce the sourcing company I work with? I have been living here for 10 years and know many factories. I am not a sourcing company in Vietnam that works on commission basis. My clients pay me up front. I am a scout. I help you find the right factories fast and put you in direct contact with them. The first step is for me to know clearly what your product is. The more details you share with me about your product the easier it is for me to identify a factory that can make it. The second step is to know any special requirements the factory must have like certification and size. I have created a contact form to make it easy for you to answer the questions I need to help you. If you have your product specs and are ready to meet factories then please fill out my contact form. If you are new to manufacturing and just have questions then I'd be happy to answer your questions and give you my advice. I offer consulting which you can book online and chat with me on Skype. Or you can read my books which systematically cover all the topics you should be familiar with before contacting overseas manufacturers. My specialty is apparel and I can help you with non-apparel. The team I work with offers services like factory introductions, factory visits, audits, quality control and more. We do not work exclusively for any factory. We charge one service at a time and our rates are competitive. We aim to help you source quickly and become your long term sourcing support service in Vietnam. We can help you set up offices, register your business, hire staff and find places to live. If you pay us, you become part of our family. First we need to know basic information. Are you a start up or are you an established business? Are you sourcing apparel or non-apparel? Do you want to work directly with the factory? Which sourcing service interests you the most? What is the problem you are facing? What are your business goals in Vietnam? Contact me, share your story, and let's see if we can get you up and running in Vietnam quickly. I built this website many years ago knowing that Vietnam would grow to be a powerful manufacturing country. Instead of building my own sourcing company in Vietnam I teamed up with a veteran sourcing expert who already had a team of people who can execute the work you need. My role is marketing and pre-sales. I listen to what you need and offer you options. Professionals who have been sourcing in China for many years need different services compared to start ups who have never sourced manufacturing overseas. My job is to hear your story and then quickly point you in the right direction. I am very good as working with both professionals and start ups. Do you want to work directly with the factory? Nowadays most people want to work directly with factories and don't really need a sourcing company in Vietnam. Myself and the team I work with are not trying to be your agent. We will not put ourselves between you and the factory. On the contrary. We introduce you directly first, if you need additional services, we will be there for you. Looking for manufacturers/factories in Vietnam? We will identify as many factories who match your requirements as you need. Using our large network of suppliers, we will provide you with a standard profile of the factories with all the necessary contact details (first name, last name, phone #, email and website) so that you can communicate directly with them. We are able to assist if there are any communication problems. We guarantee that the factory is capable of making your product. We guarantee that you will have an intelligent conversation with you. We can’t guarantee price, quality, delivery dates, payment terms, capacity or personality matching. We aim to be the best sourcing company in Vietnam. We will arrange the itinerary, car and translator to visit factories for you. If travel is required outside of Ho Chi Minh city then we will give you an estimation beforehand. If factories are in HCMC then car and translator are included. If factories are outside HCMC then we ask you to pay for all transportation. We can visit 3 to 4 factories per day. We aim to be the best sourcing company in Vietnam. We will work with the factory to get the most competitive prices based on your specifications. We will not involve you in the whole process but it will be transparent. You will then deal directly with the supplier when you do the final order negotiation/confirmation. If you have a target price and tech pack then we can get a quicker response from factories. We can manage sampling, approvals, production planning, shipping documentation and more. We believe you can perform this more effectively by yourself, but we can provide this service if you wish. Cost is negotiable and depends on specific requirements. ii. We will suggest available fabric, trims, accessories and design improvements. iii. We will manage sampling, sample shipping and approvals. We aspire to be the best sourcing company in Vietnam. We have a team of experienced QA and QC. Depending on the reliability of the factory we recommend adapted inspection processes. A. Pre-production meeting: when the production green light is given and all components are in the factory, before starting cutting, we will meet with the factory key players (management, departments leaders and factory QC). We will check if components in house are conform; we check if all technical information is unambiguous and clearly understood (if not we take necessary steps to clarify), we do a risk assessment where we identify the manufacturing operations that are likely to cause quality concerns and we take preventive measures with the factory to control these operations; and we check the production plan to ensure the due shipment date can be met. Depending on order size and inspection results we perform one or more inspections when the production is ongoing. Ideally we perform the 1st inline when the first pieces are completed. We will scrutinize the first finished goods as well as each manufacturing operation. We also audit the factory internal QC process. We make sure the supplier take corrective action when flaws are found to avoid recurring defects. If the quality is not satisfactory, we will return day after day till we are satisfied, but this extra cost should be supported by the factory. Depending on order size and risk we will perform additional inline insurrections when 25% and/or 50% of the order is completed. Rest assured that during inline inspection stage, the inspectors at Vietnam Insider sourcing company in Vietnam randomly inspect the various stages of production as well as finishing and packing based on AQL method and report the findings. In the final stage, the inspectors (based on AQL system) check packed goods and verify all aspects of quality before shipment. When all goods are packed and ready for shipment we perform a random AQL inspection to assess the actual quality level of the goods. All inspections findings are reported in English with pictures either in a format you supply or in our standard comprehensive format. Cost: based on man-day with decreasing fees when increasing the frequency. 150$ per man-day if we perform over 12 inspections per month. Once we reach over 12 inspections per month we can switch over to a fixed price per piece covering all inspections from pp-meeting to final. NOTE: if the factory is very remote we might need to add transport costs. But we will inform you about this when introducing the factory. If there is anything that makes any customer satisfied, it is ‘quality’. We do assessment and re-assessment not just on compliance but also on quality and efficiency. It is always quality that brings money for an organization. We perform audit visits to the factories to evaluate the level of social & environmental compliance. We produce a comprehensive report with pictures aa well as a CAP (corrective action plan). We perform compliance assessments of the factory you choose to evaluate the level of social & environmental compliance. We produce a comprehensive report with pictures as well as a CAP (corrective action plan). We provide guidance to factories to improve quality, productivity, social and environmental compliance. We give legal, logistical and business advice for investors who want to setup a factory or buying office or conduct any other activities in South East Asia. Cost will be negotiated based on your requirements. We will help you find a qualified staff to work for you in Vietnam. You will be charged an amount including a 1 month ad on VIETNAMWORKS website, filtering of CV's, 1st interviews with reports, and coordination of 2nd interview with you on Skype. Are you looking for an interim solution to test the waters before committing to opening an office in Vietnam? Or, do you want to setup your team in an active environment with access to an existing network without the hassle of finding a place to rent? Desks will be in a shared or private space. Price includes basic office facilities: utilities, air conditioning, shared meeting room, shared kitchen, security, parking for staff, basic furniture. We aim to be the best sourcing company in Vietnam. Our tech pack creation service does not include design. 1. What kinds of suppliers do we use? 2. Do you receive commissions from suppliers? No. We charge our upfront fee and that's it. We give you the suppliers contacts you can work directly with them yourself. 3. What happens if the factories we introduce don’t meet your expectations? Once, we introduce you to factories, you will be able to contact and work directly with them by email. If factories don’t reply then we will get involved and make sure the factory replies. If the first three factories don’t meet your expectations, we can introduce you to more. Our experience is that Vietnamese factories are slow to respond. 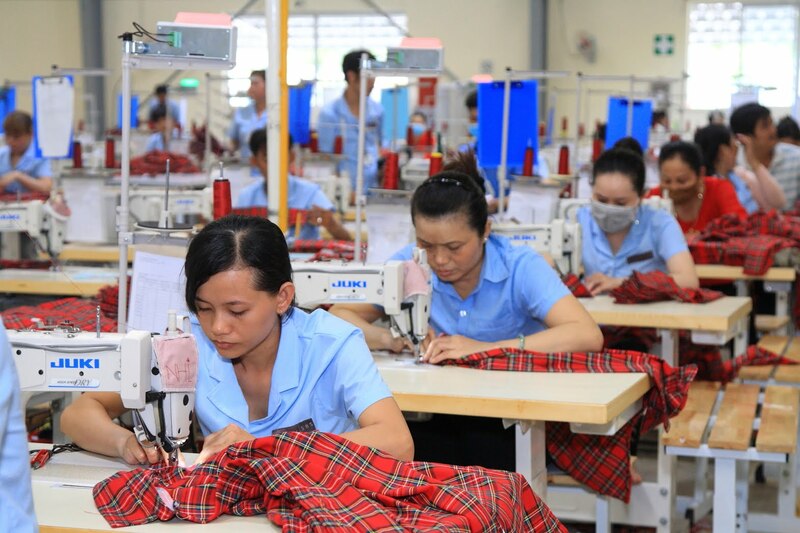 The cheapest and fastest way we can help you is to recommend Chris's book called Guide to Producing Garments in Vietnam. Chris becomes a Vietnam sourcing expert and the book is full of insider knowledge, tips and referrals based on his 10+ years of experience working in the Vietnam garment industry. You can read the book at your own convenience and use it as a long term reference. You can opt to buy it either on Amazon, Kobo, iBooks or on buy it directly on our website for $US 9.99. Do you need a women's apparel manufacturing agent in Vietnam? I often introduce myself as a manufacturer because there is such a negative stigma about agents. The value I offer as a women’s apparel manufacturing agent in Vietnam is worth 100 good night sleeps. If you need an agent, then contact me. If you don’t need an agent then contact me anyway because I offer consulting that can save you time and money if you are new to women's apparel production in Vietnam. My journey began in Vietnam 20+ years ago. I was hired as a country manager overseeing the production of 200,000 women’s woven fashion garments produced per month for shipment to Europe. With my finance background and understanding of the high street in the EU I mastered the art of working with Vietnamese suppliers, managing quality, developing samples with good designs using cutting edge fabrics and trims and managed to shipping on time 9/10 times. Over the decades I have watched as buyers shifted from China, Hong Kong and Thailand to Vietnam to tap into the high quality, low cost Vietnam offered back then. I took my clients under my wings and navigated them through a war-torn country and shoId them how Vietnam was evolving into a modern society with the fastest rising middle class in Southeast Asia. I managed to get them capacity in my arsenal of reliable women’s woven fashion factories. Fast forward to 2019, getting capacity at low prices is as easy as winning the lottery. I win 9/10 times. Coats, blazers, trousers, blouses ,dresses, skirts and jump suits are what I know best. I know what can be made for the best price and quality in Vietnam. I have successfully shipped for many of the international labels like Escada, Jils Sanders and Max Studio. I develop 200 samples every month to offer my customers trending designs and showcase the latest fabrics my textile mills are offering me. I have a full technical design and QA team to ensure the manufacturing process runs smoothly and efficientlyI have built up a library of fabric suppliers over the year. I source fabric out of China, Korea, Taiwan and Vietnam. The majority of the fabric we buy is ITY out of Korea. We have great sources for Georgette, Crepe, Chiffon, Cambric and Chintz. We get the fabric into Vietnam, to the factories and re-exported within 30 to 90 days. The challenge we face today is that Chinese orders are flooding the Vietnamese market. On one hand it is good for Vietnam because factories are bursting at the seams but, on the other hand, it’s getting harder and harder to get capacity at cheap prices. If you are new to Vietnam then anticipate getting in line. Anticipate being offered high prices initially. Or, step in the front of the line with us and let us, get you, the right price quickly. Customers want to deal directly with factories because they see it as a cheaper option. In reality it is not. While larger factories are easy to work with because they have merchandisers that speak English fluently, most of the larger factories have high MOQs and are fully booked with the Walmarts of the world. If you want to work with smaller MOQs and smaller factories like we do, then the language barriers become formidable and when problems happen, communication breaks down, delays happen. Our presence is required on site to solve the problems clearly and quickly. We add additional value on the client side as well. We have offices in the Europe and often visit clients to facilitate problem solving - clearly and quickly. Working without an agent can save money when everything goes well. Working with a women’s woven fashion agent in Vietnam like us, saves you money in the long run when you factor in unsellable goods, late shipment fees and last minute air shipment fees. Let us deal with sampling, production and shipment. Yes, we charge a commission but in the long run you will save money as well as get 100 good night sleeps seasons on end.